Time for another Project Challenge – this time our category was ‘furniture’. And you can link up your own furniture projects here too! 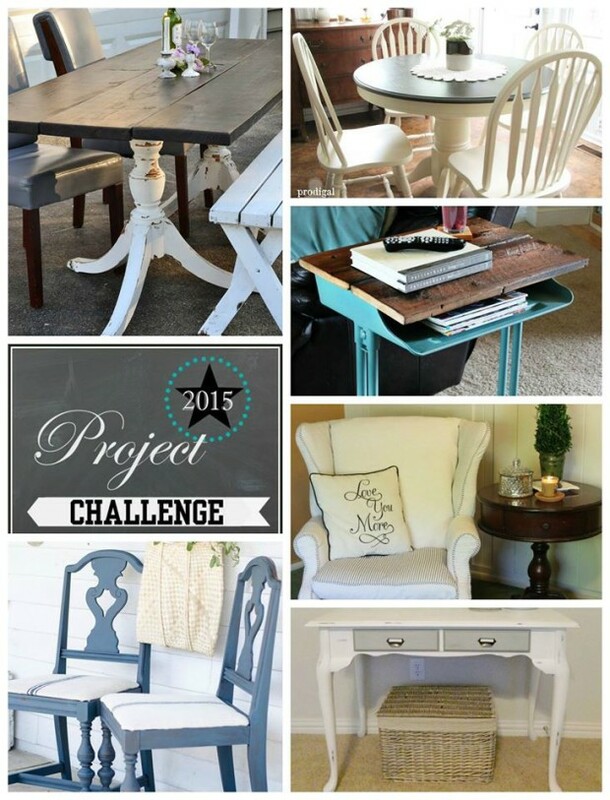 Project challenge – catergory Furniture! What fun! 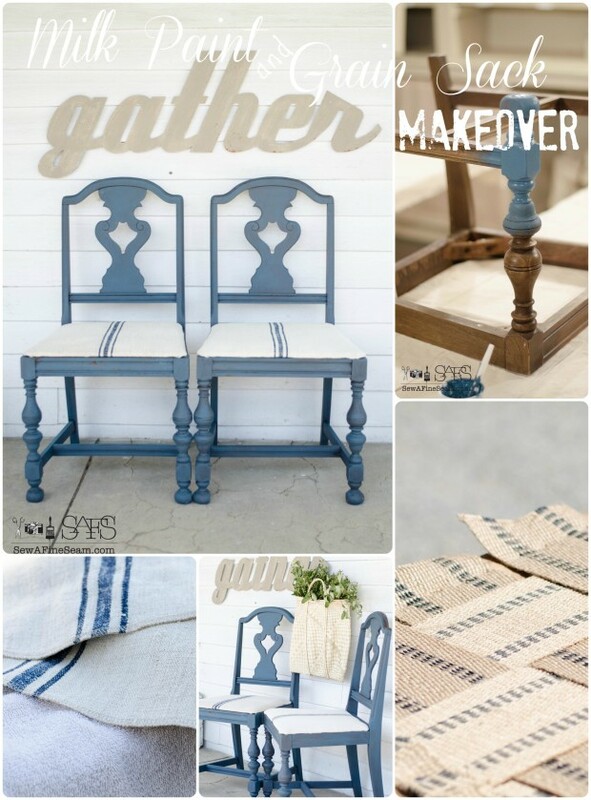 You know I love a good furniture makeover – and I usually have plenty of that going on around here. 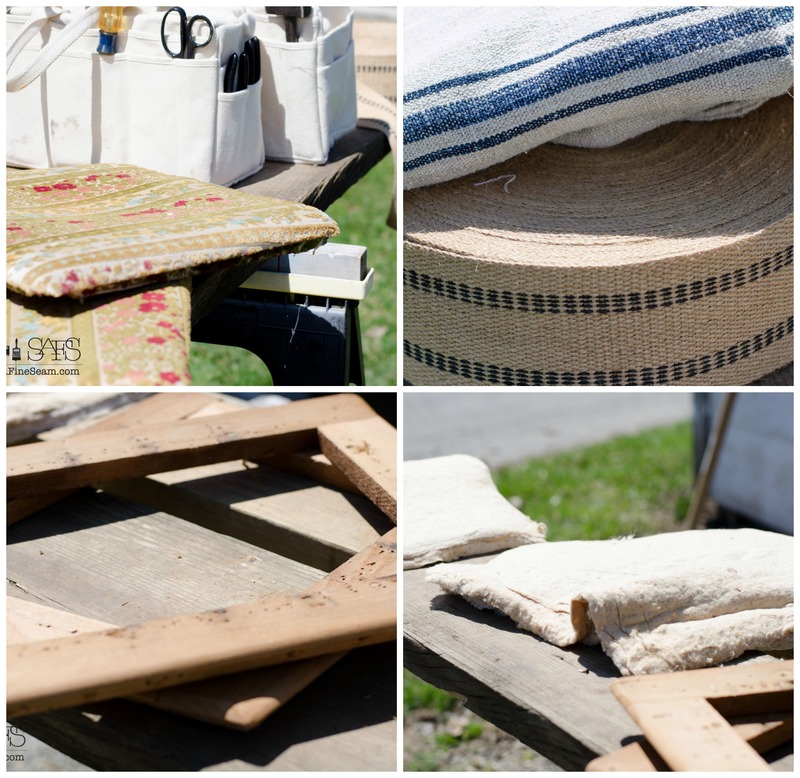 I’m sharing my Milk Paint and Grain Sack Makeover. I have had these 2 dining room chairs in my stash for awhile and I finally got them finished. I started painting them several weeks ago but they got pushed to the back burner when other, more important things demanded my attention. I had a before pic but it has gone missing – you can see the dark wood in the photos where I was painting and you can see the old seat cover in a photo coming up. They weren’t pretty and the seats were really worn and saggy. 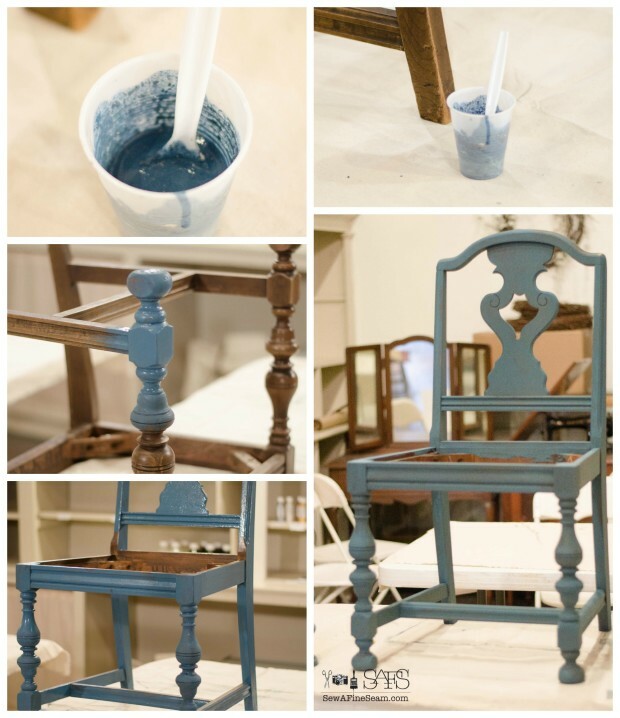 I used Miss Mustard Seed’s Milk Paint in ‘Flow Blue’. The finish was pretty much gone – not shiny at all – however I got some great chippiness anyway – I love when milk paint does its thing and I get some authentic looking wear to it. I gave each chair one coat of paint and then let them set for a few weeks till I could get back to them. You can see here some of the places the paint chipped off. Because the wood was dark and the blue is also dark, one coat of paint and a quick rubdown with 400 grit sandpaper and I was happy with them. Now they needed a finish. I don’t really like to wax so I used some of the new products I’m carrying – Paint Couture! glaze. I love the glazes so much and it went on over the milk paint wonderfully. I used the walnut black and it really picked up the chippiness and details on the chairs. Glaze can work as a finish if the piece is not going to be heavily used – I let the glaze act as the finish on these. For a table or cabinets I would add a couple coats of lacquer too. On to the seats – you can see the original fabric in the top left photo – not a horrible print but it was dirty and the webbing in the seat had stretched and made the seats sag. They needed completely deconstructed and put back together properly. My hubby helped me with this pulling all those staples took awhile even with two of us working on it! Pulling the webbing tight was easier with two of us also. We kept the cotton batting to reuse – batting is expensive and this stuff was reusable. I have a whole roll of this jute webbing. I use it now and then for crafty stuff. For this project it got used for what it was intended. My hubby did some of the stapling and I did some – It worked well to have two of us to pull the webbing tight and staple it securely. After stapling the first three strips on we wove more strips through the opposite way and stapled them fast too. 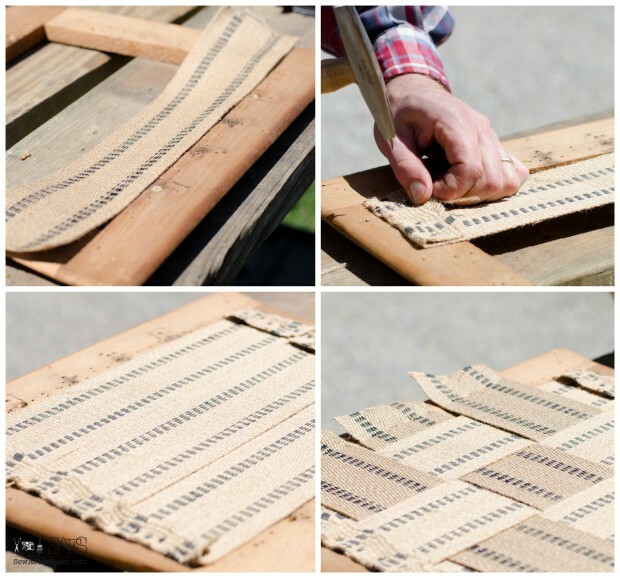 After fastening on the webbing, we replaced the cotton batting and I moved on to the best part – adding an authentic European grain sack as the seat cover. I cut the grain sack about 2 to 3 inches wider than the seat all the way around and then used a serger to finish the edges. This keeps the edges flat but also neat and non-raveled. YOU NEED A PNEUMATIC stapler. No comparison – if you want to do this very often just go buy a pneumatic and an air compressor. It will make a project like this so simple and easy. Seriously. The correct tools make ALL the difference. I secured the grain sack snugly – starting in the center of the front (at the stripe) and then doing the back side starting with the stripe. You want to keep it snug but not pull too tightly. 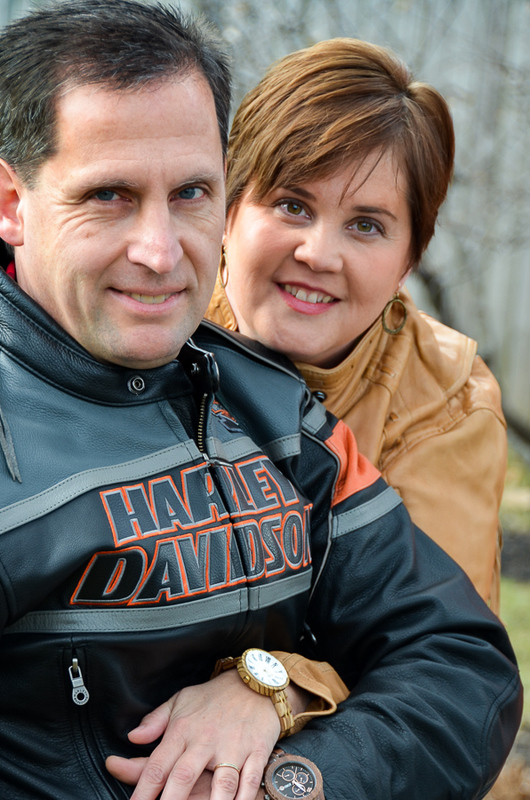 I tried it on the seat for fit, then put the screws back in to hold the seat in place. 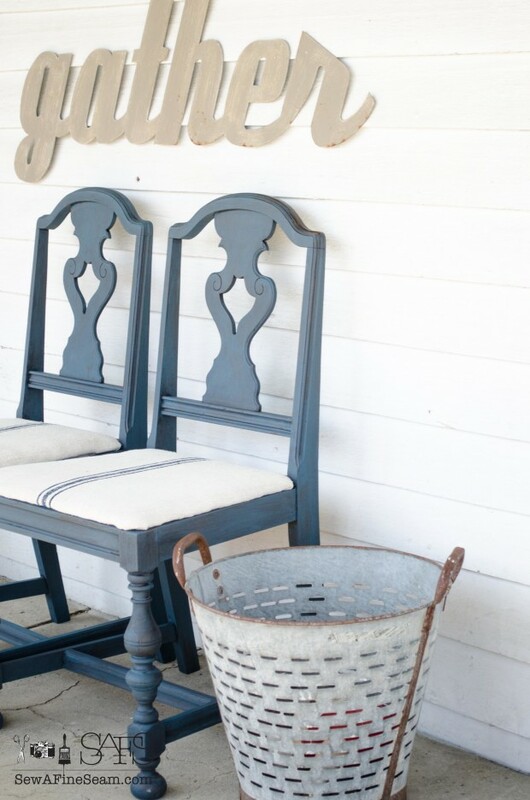 I think the milk paint, chippiness, and black walnut glaze created a perfect new look for these old chairs. I’ve been using glaze from the Paint Couture! line for a few weeks now and I love it more all the time. You can see more ways I’ve used glaze on airplane art and a decor rocking horse. And now you need to check out the other bloggers who are in the Project Challenge with me – they have some great projects too! 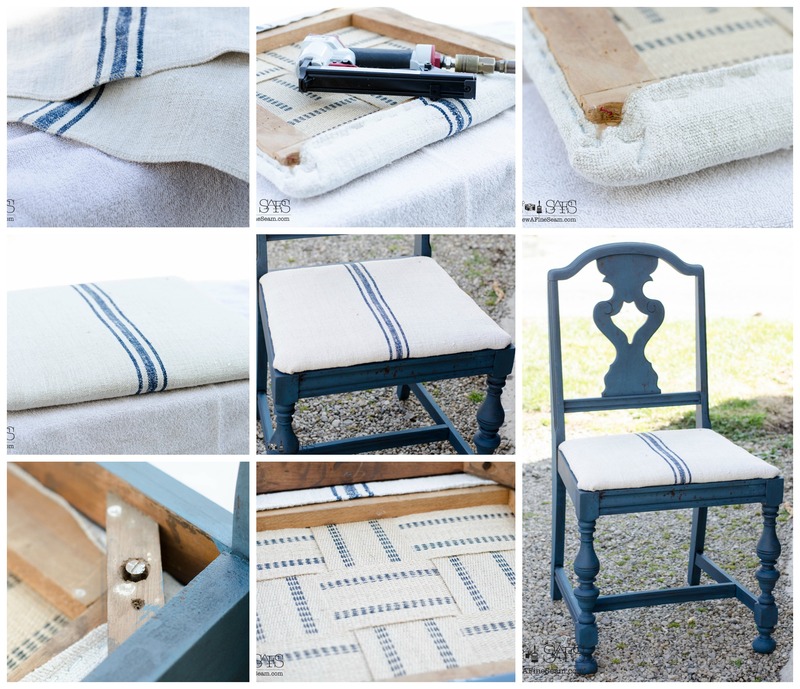 And NOW link up your own furniture projects! And join us again next month our category is ‘fencing’. So if you have a project that involves fencing make sure you get it done so you can link up with us – last Friday in May. The chairs are so pretty! 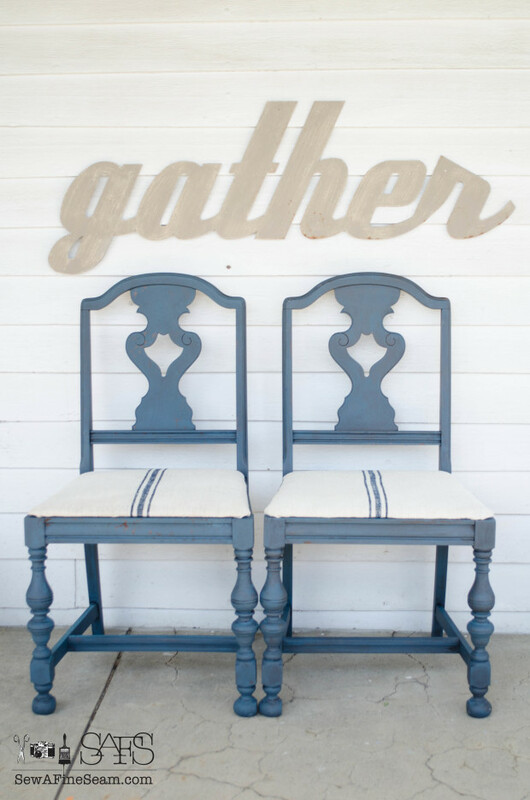 I’m not usually much of a blue person, but I really like this shade of blue and the glaze really gives the chairs a richness! 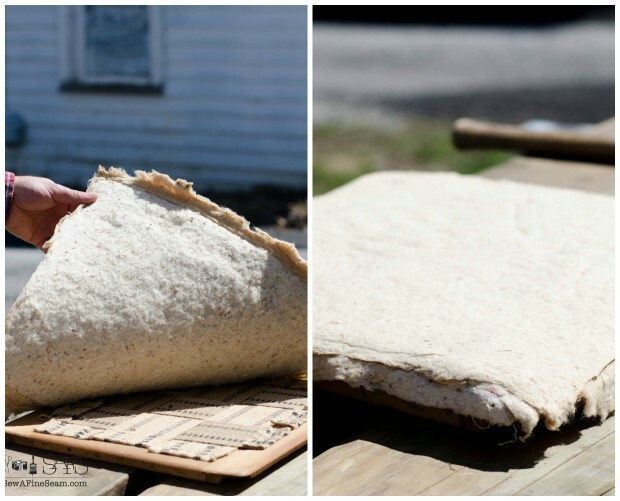 The grain sack cushions are the cherry on top of the ice cream sunday…wonderful! love the change! and that gather over the chairs! I love this so much! I have yet to try milk paint, and I think I’m getting the feeling I am going to have to try it in the very near future. 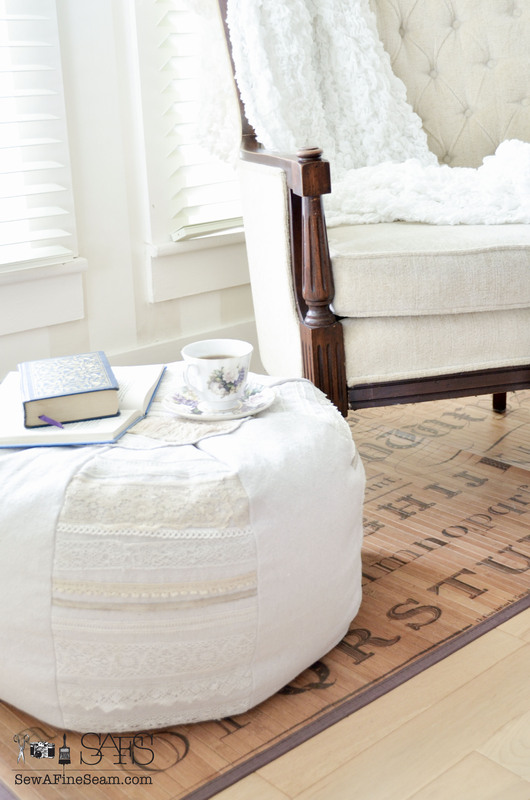 The color, the grain sack…everything about this is perfection! 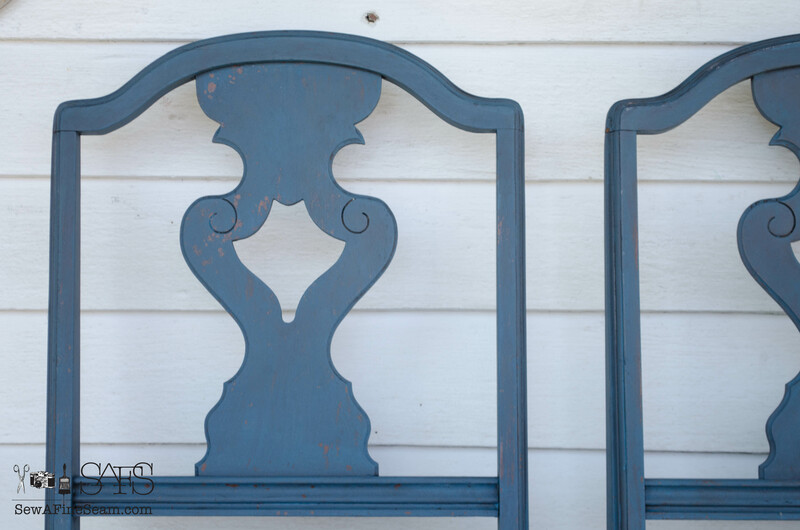 Milk Paint is so fun Deb – it’s different from any other paint and you just go with what it wants to do and let the project unfold as you go! Absolutely fantastic–love these, the color is divine! Amen on the pneumatic stapler!! So much easier. 🙂 Your rocked those chairs, Jill! This stapler makes me think I can tackle a real upholstery job someday! Awesome!! Love how they turned out! Aww, thanks Holly! This project was fun and turned out better than I even hoped! You did a beautiful job, Jill. I love the chairs and the cushions are awesome!! I’ve never used MMS milk paint. I’m getting ready to do a round oak table with a Formica top and four Windsor chairs. Would you recommend the chalk paint? I know I have to do some serious sanding of the table top and I have some varnish on the chairs. Recommendations? Thanks, sweetie! 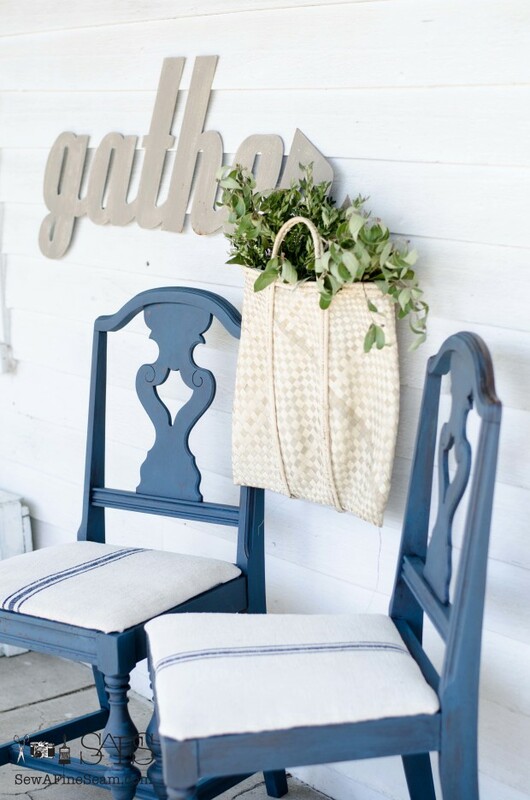 Hi Jane, chalk paint would work for your table and chairs – my first recommendation though would be the paint line i’m selling now – Paint Couture. It’s a high quality, acrylic resin and it sticks better than chalk paints in my experience. It self levels itself as it drys, goes on so smooth and lovely! Then there is a wonderful lacquer finish you can put on it that will protect that table from wear and tear – you can get the lacquer in any finish you want from dead flat to high gloss. Where are you located? There might be a retailer close to you!